I gave my Sec 3 (year 10 for the British amongst us) students a speaking activity on Friday, to discuss and reason the phrase ‘A change is as good as a rest’. Some struggled to grasp the concept as they explored it but I knew I was looking forward to illustrating the answer with my weekend away. At 3am the following morning I woke up bleary eyed and grumpy. I had barely slept and after 12 straight days of work (I’m counting a weekend conference as work) I was exhausted. Still, today a group of us were heading to the beach, Ngwe Saung to be precise, to sunbathe and pamper and relax. The 3am start was essential because Ngwe Saung is a 5 hour car ride away and we wanted to maximise our time on the beach. The driver had arrived early so, after a brief detour to pick up the last in our party, we were on our way. Yangon in the early morning is still a wakeful place. Shops are open, rickshaws are available and trucks full of sleepy eyed men trundle their way along the bumpy roads. Pagodas shine under their disco lights and there is movement of sorts in all the townships we passed through, but you could tell that the town was resting. The street stalls were empty, rickshaw drivers slept in their seats and the smiling faces were more serious at this time of the morning. Having been in Yangon for five weeks already I was itching to see more of Myanmar than simply my side of the city. I longed to see greenery and open spaces and life of a different ilk. I wasn’t disappointed. Sunrise is about 6.00 here. We were crossing the Ayeyarwady River at that time on a huge metal, machano bridge whose sister sat a short distance upstream. It was a smooth but brief respite from the potholed road we were travelling. Traffic had been consistent all the way from Yangon, a steady stream of trucks and cars in varying states of repair. Some looked like they should have been retired from the road after WW2 yet they were still rolling along at a steady speed. The road itself could only be described as an ordinary A road by British standards. Wide enough for traffic on both sides, everyone drove straight down the middle where the potholes are fewest, beeping their horns at the traffic in front to move over as they came through. This is made more difficult due to the slower traffic at the side of the road. Bicycles laden with merchandise, mopeds laden with families and pedestrians wending their way to… Well, who knows where?! So a series of darts, swerves and sharp breaking, punctuated with flashing lights and blaring horns, characterised our journey. As the daylight grew we discovered we were free of the city limits and travelling a straight road followed by telegraph poles and surrounded by green paddy fields. Yet, in spite of all the wild land and space around us, this environment was even more alive than Yangon. The road seemed to be the main artery through the Delta Region. Long, linear communities congregated beside it with plenty of houses on stilts sitting crookedly above fields of water. Wherever you looked rural life was going on. Every field seemed to have at least one inhabitant, usually in a conical wicker hat, bent double to work the rice crop or wending their way towards the road. Men fished the broad ditches, by rod, from a boat or by dragging a net up through chest deep water. Children and families gathered by the road side to chat, or sell things, or eat. Every bridge had people sitting on it, watching the world go by. Strangely this world seemed set apart from other places. It slowly dawned on me, as we passed rusty trucks and dilapidated buses, bamboo bridges and strange vehicles that seemed to be mini passenger tractors, that this world wasn’t tainted by modernity, it held on to its charm and authenticity because it hadn’t been exposed to the outside world for very long. It was, very definitely, still in the Twentieth Century. We arrived at The Emerald Sea Resort in good time. Once checked in, and fed and watered, we headed to the beach. 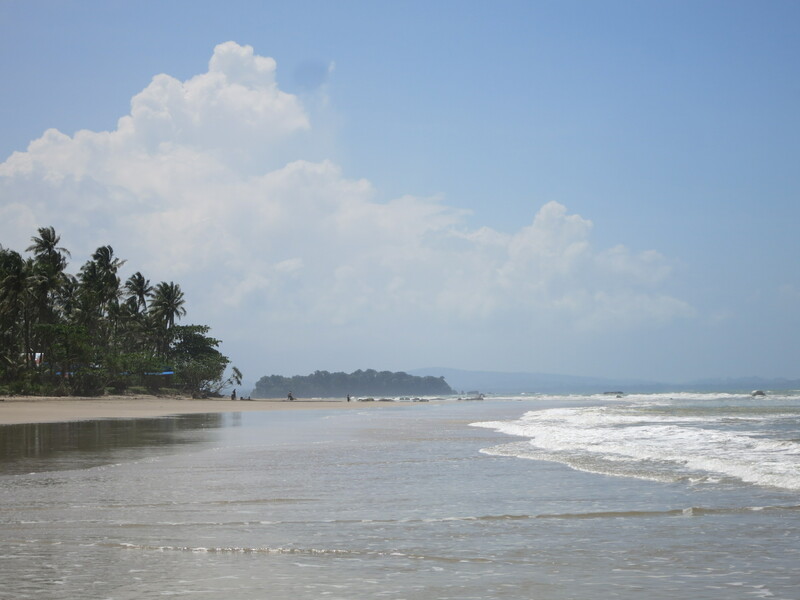 Ngwe Saung is the cleaner, quieter, tropical beach of choice for middle class Yangonites to visit. Out of season, it was virtually deserted with just a handful of guests and only one Burmese family in sight. The beach itself is 13 km of blonde sand and palm trees facing the relatively clear waters of the Bay of Bengal. Monsoon season made the sea a little rough but we were lucky enough to arrive on the first sunny day they had had all week. Clear blue sky and miles of empty sand invited us to stay. It only took me an hour in the sun to get burnt. Even with suntan lotion on (factor 35 as well) I could feel myself burning very quickly. Shade was at a premium and even when I retired to the pool side I could still feel the heat. Lunch and a full body massage at the Spa brought some respite and I was certainly relaxed by the end of the day but the damage was already done. A touch of sunstroke put paid to my plans of a seafood banquet for dinner and I was passed out (almost literally) by about 7.30 pm. Twelve hours later I slowly woke to the sound of the sea on the shore. The sky was less clear this morning and the palm fringed beach was not quite as inviting so I spent my time around the resort. The white, slightly aged bungalows nestled amongst tall palms and were separated by brick pathways snaking through verdant lawns. The pool and restaurant were at the heart of the site and were tranquil places to sit and read or take another spa treatment, where the only sounds were bamboo wind-chimes and the whisper of the sea. Reluctantly, we left the resort after lunch. The landscape was just as alive at this time of day as it had been in the early morning, in spite of the heavy rain that had set in. 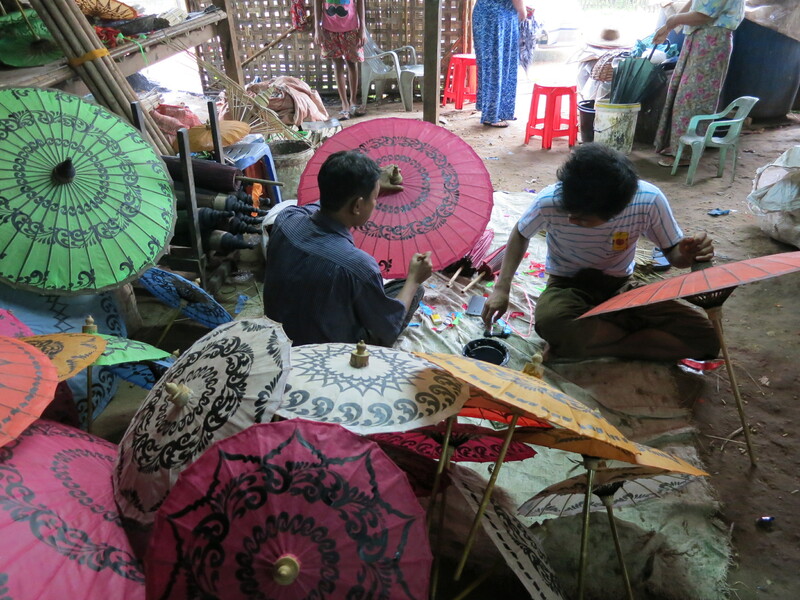 This time we took a detour via Pathein, Myanmar’s fourth city and home of the workshops that produce the famous hand painted parasols . After a few false turns and several long conversations that characterise the Burmese method of asking for directions (why give simple instructions when four or five of you can discuss the best route at length?) we came across a small family workshop tucked away up a side street. Typically the front of the building was the workshop and a small cluster of rooms at the back was the family’s home. The workshop was filled with umbrellas of all sizes and colours and states of completion. Colourful cotton was being painted on the floor before us as we gazed in admiration at the workmanship. Intricate patterns appeared before our eyes in no time at all and handles were fixed upon our chosen purchases while we waited. We learnt that silk parasols are for the dry season to protect you from the sun (a bit late for me this time) and the cotton are sealed with a persimmon resin to make them waterproof in the monsoon. Happy with our purchases we continued on our way back to Yangon and all too soon we reentered the fug and bustle of the city. While our visit to the beach had been all too brief I felt I had illustrated the idiom I had taught Sec 3 just two days before: a change (of scene) is as good as a rest!